Details: Inaugural Decade Dash 5K Car Show 2018 Overview For the past 7 years our automotive partners at Graff Chevrolet have hosted an awesome car show that has grown bigger and better each year. They are excited to announce that they are moving their 8th annual Car Show to Uptown Bay City with the addition of a 5k Run/Walk and 1 Mile Fun Run to the event! The move to the beautiful Uptown Bay City area means more room for the car show and a great venue for the 5k Race and a 1 Mile Fun Run. This is all made possible with the help of Uptown Bay City! 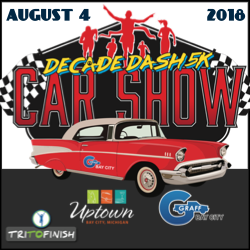 The 2018 event has been renamed the Decade Dash 5k & Car Show. Uptown Bay City is the perfect location to enjoy a run along the riverfront and to relax while looking at classic and custom cars. As in the past, all proceeds will benefit Just for Kids, a 5013C Charitable program. With your help, Graff Chevrolet, Uptown Bay City and TriToFinish believe the new event will be a big boost to benefit our local children. 5K Course With the Saginaw River and the beautiful structures of Uptown Bay City as the backdrop, the 5K course will be set along Bay City's Riverwalk. The course will have slight winding small inclines but will be predominately flat. The 5k runners will start out at the fountain in Uptown Bay City and head south towards the Middlegrounds and then circling back to the finish in Uptown Bay City. OVERALL AWARDS Awards will be provided 3 deep to overall male and female winners and overall Masters (40+) male and female winners of the 5K Run/Walk. In addition overall winners will receive free entry to next years Decade Dash 5k Event. 2nd Place overall finishers will receive 50% off and 3rd Place overall finishers will receive 25% off entry to the 2019 event. NOTE: All participants will receive high quality finisher medals at the finish line upon completion of their event! While age group results WILL be provided, this years event will NOT have age group awards.